Can I create a bespoke Outdoor Living Pod™? We can overcome obstacles that other companies cannot. At Caribbean Blinds we pride ourselves on being specialist in our industry, with over 30 years’ experience we have come to understand our customers and the complexities of some projects. Our team have gathered knowledge over the years that have enabled us to push our designs further to meet the client’s specifications. We do not turn jobs away just because they look problematic, we will assess the situation and accept the challenge and work with the client to come up with the neatest design that will be fit for their purpose. Our Outdoor Living Pod™ continues to rise in demand as the outdoor living trend increases year on year. 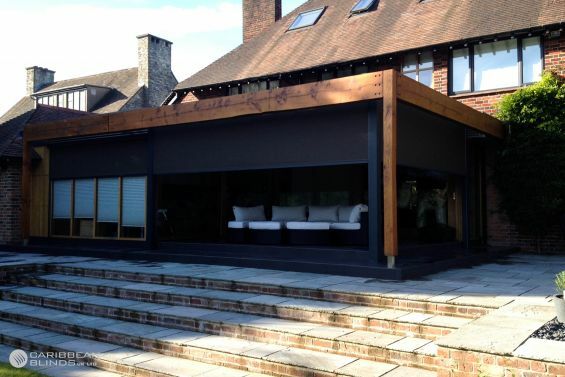 Its streamline, robust design and all-weather proof features make this a popular choice for outdoor dwellers of the UK. 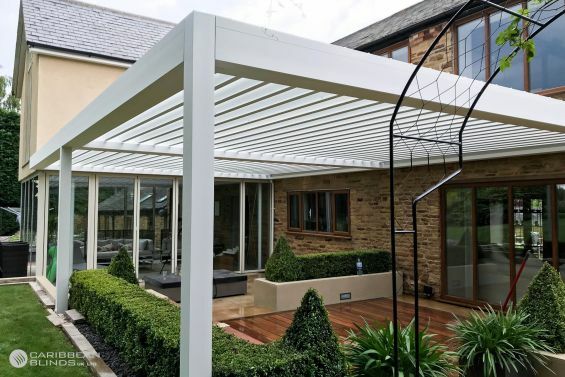 The louvered pergolas rectangular structure means it can fall into place easily in most landscape garden designs but there have been some occasions where it has not been so simple, where the layout is not so linear or there are some obstacles to overcome. This is where our specialist design team work their magic and create bespoke patio canopy designs using a combination of intricate aluminium infills and brackets. If there are walls in the way we can amend the structural post to sit on top, if there are gaps which need filling we can create a flush design using infills to ensure no moisture can pass through. If you are looking for a roof only structure to be an extension of your existing building design then we can work with your architects to create a structurally safe system that can be supported by steel cross beams to give a natural flow of your architectural design. 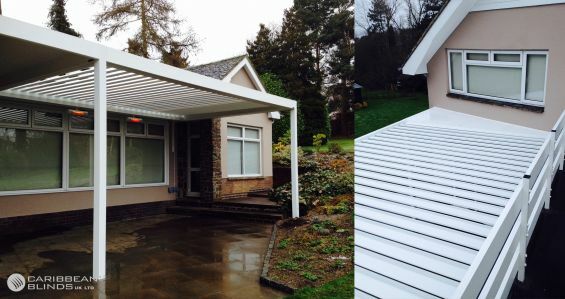 The design options are flexible when it comes to our louvered roof systems because we have refined the design over time and with the combination of our skilled technical team and experienced designers we are able to push our Outdoor Living Pod™ to its limits so that you can create the perfect louvered canopy in your garden. Contact our team today to discuss your options on 0344 800 1947 or alternatively you can get a guide price using our enquiry form and we will also send you on of our NEW Product Information Brochures detailing the specifications of our Award Winning Shading Solution.